It was a big day for Bellshill Athletic as they made their long-awaited return to their home town after a seven-year absence on Saturday. Bellshill took on Petershill at Rockburn Park in their final Euroscot Eng Sectional League Cup encounter. However it wasn’t a happy return as within nine minutes they were down to 10 men, Green seeing red for conceding a penalty which McAnespie converted to put the Glasgow side in front. Chisholm got a second in 28 minutes and after the break Davidson had another spot-kick saved by Bellshill keeper Peat before adding a third five minutes from time to complete a 3-0 win. Elsewhere Lesmahagow came desperately close to snatching a place in the knockout stages with a remarkable 8-3 win at Forth Wanderers. 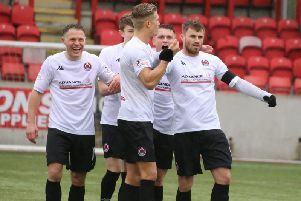 ‘Gow went into their final match three points behind group leaders Larkhall Thistle, who had completed their programme, and needing an eight-goal winning margin to overhaul them - assuming Lanark United, on the same points as ‘Gow, didn’t also go goal crazy against Royal Albert. Lesmahagow were already 3-0 up at half-time and with Forth keeper Paul McKane off injured, and replaced between the sticks by midfielder John Watson, they piled on the goals after the break. With 15 minutes to go they were seven up and just one short of their target, but in the 77th minute Martin Hannaway netted for Forth. An eighth goal followed for ‘Gow five minutes from time to put them just one short of their target again, but two Willie McClaren goals in the last two minutes for Forth ended their hopes of a remarkable success. Rob Roy had already qualifed from Section 8 but Rossvale made certain of the consolation of second spot with a 3-1 win over outgoing holders Cumbernauld United. Fresh from their record-equalling 7-0 win over Dunipace in midweek, ‘Vale took the lead through Coll after 27 minutes and McKay added a second after the break. Bradley made it 3-0 before David Dickson pulled one back for Cumbernauld late on. Carluke Rovers went into their last fixture with an outside chance of progress but their hopes were ended as they went down 3-1 at home to Newmains.